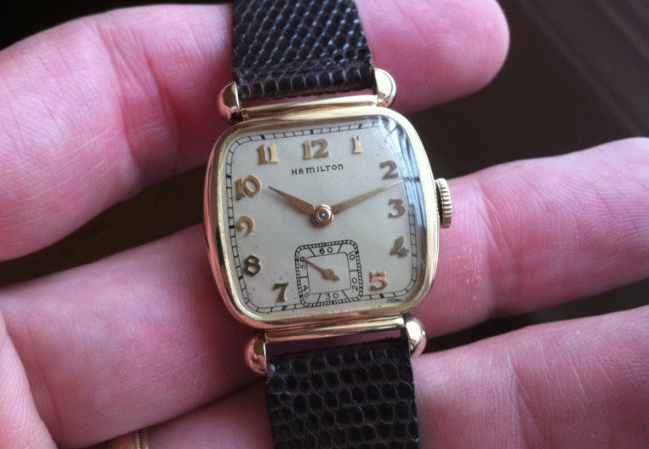 Introduced in 1941, the Martin is a pretty prolific watch. 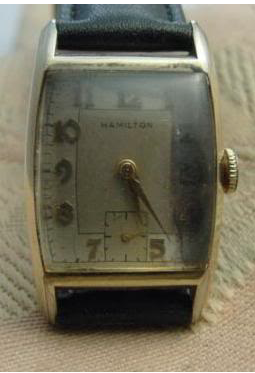 It's uniqueness stems mostly from the fact that it's one of a handful of watches Hamilton also made in Coral Gold Filled. 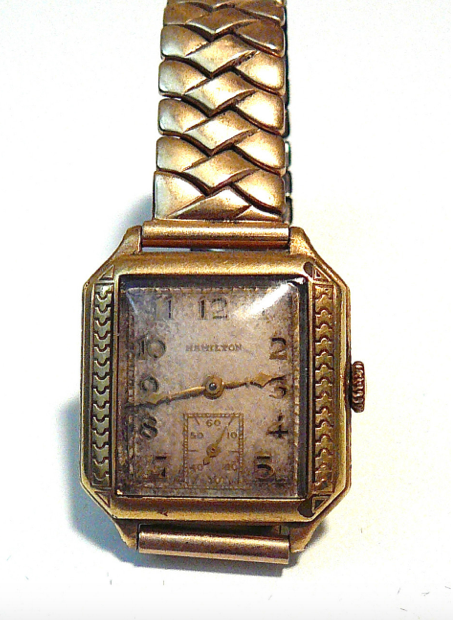 The 1941 Essex, Ross, Wilshire and Myron were also available in Coral Gold Fill. Supposedly there are also five Coral Endicotts that potentially exist. The coral models have rhodium plated solid gold numerals (white) with matching hands on a rose-colored sterling silver dial. The Martin is most plentiful in the 10K yellow gold filled case. 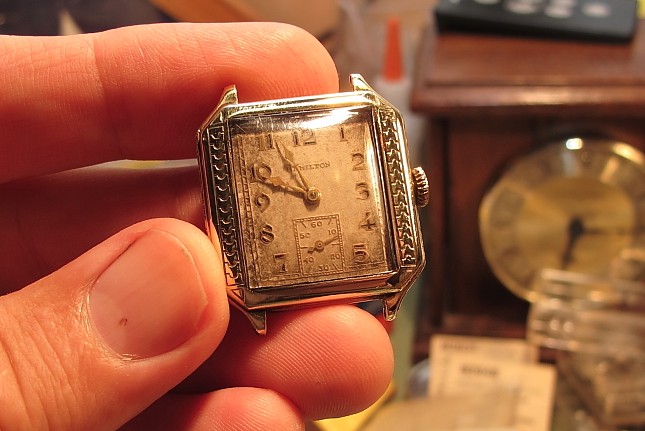 The yellow models also have solid gold numerals in yellow with matching hands on a butler finished silver dial. The real trick to getting a nice Martin is to find one with the best case possible. Martins seem to wear primarily to the tops of the rounded lugs. 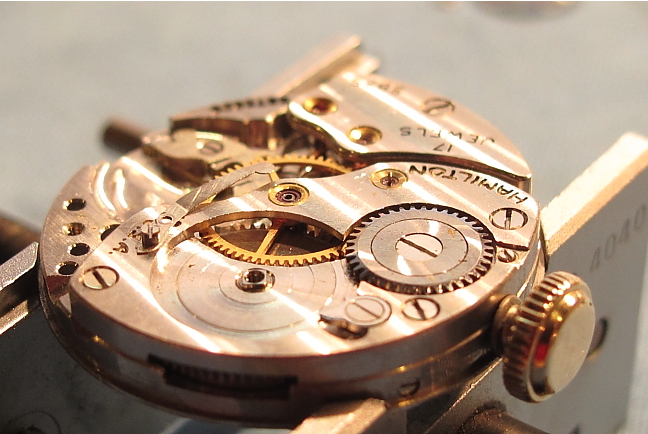 The wear can be pretty extensive and it's a challenge to find one without a least a little bit of wear. 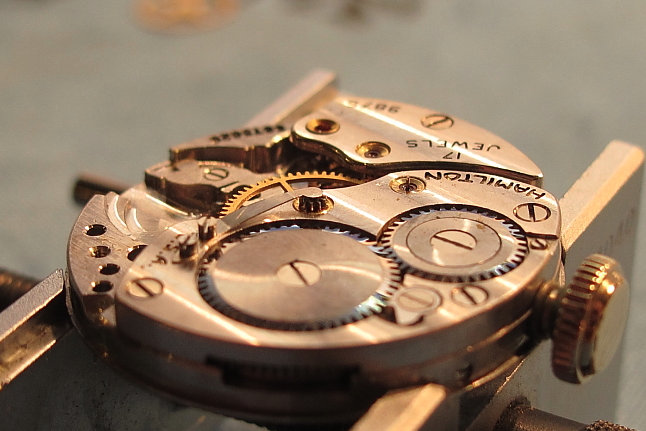 I had purchased many Martins with worn cases just to get spare movements... as restoring cases is very hard to do. 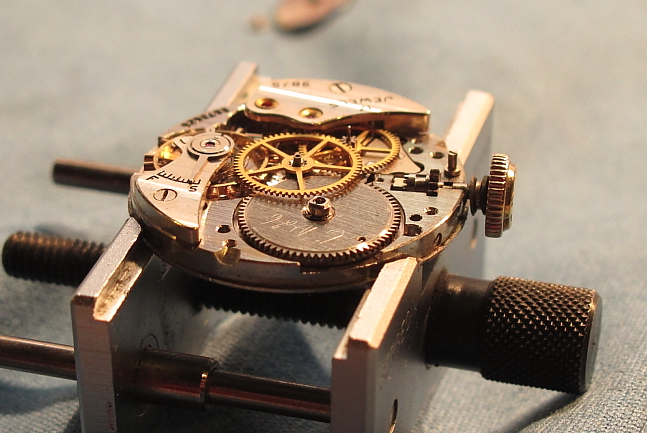 Under the hood you will always find a 6/0 sized, 17 jewel 987A movement. The Martin was introduced in 1941, disrupted by WWII, reintroduced in 1946 and made into 1948. Here's an example of a Martin I once restored. 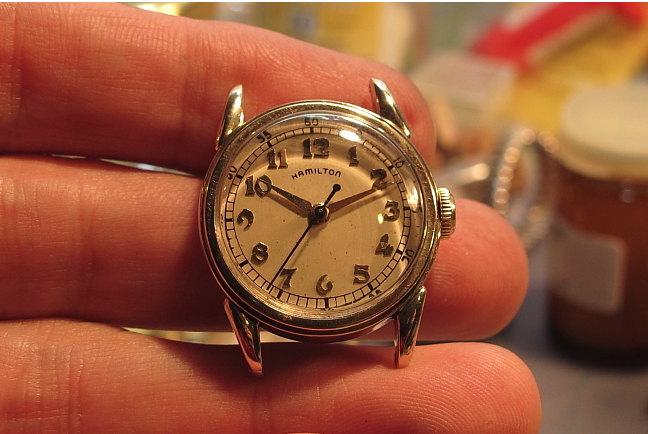 It had a very nice case but the dial was tired looking and needed to be redone. In the "after" shot you can see there is a little bit of wear through to the bottom lugs. 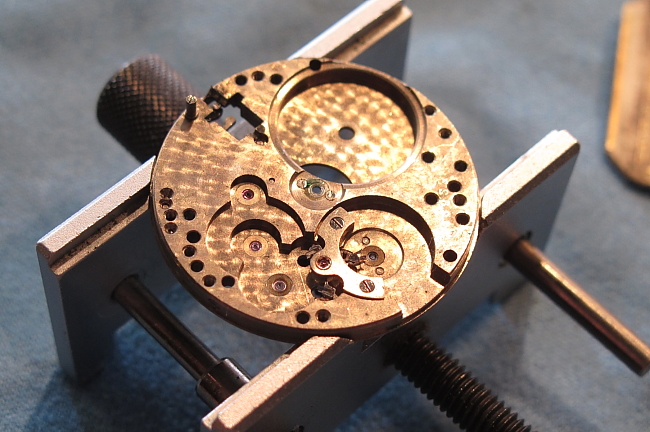 Although the dial looks correct in almost every way, the easiest way to tell it's refinished is the dial plate used to redo these dials is missing the solid zones in the seconds track on the 10 second marks (10, 20, 30, etc). A more proper second hand also completed the restoration. Here's another example of a very nice Martin I have had. 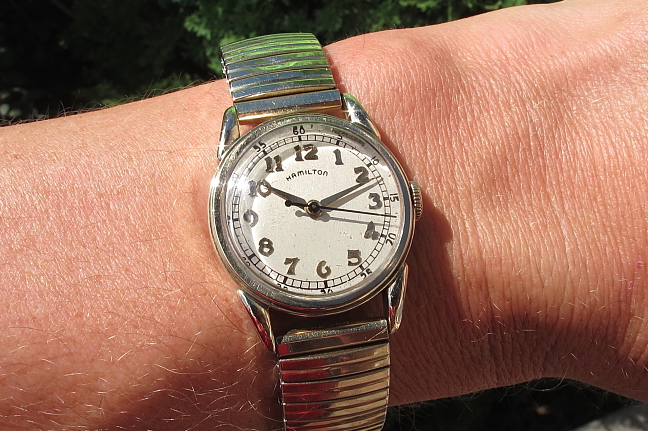 This one's case is also well above average and the original dial is excellent. 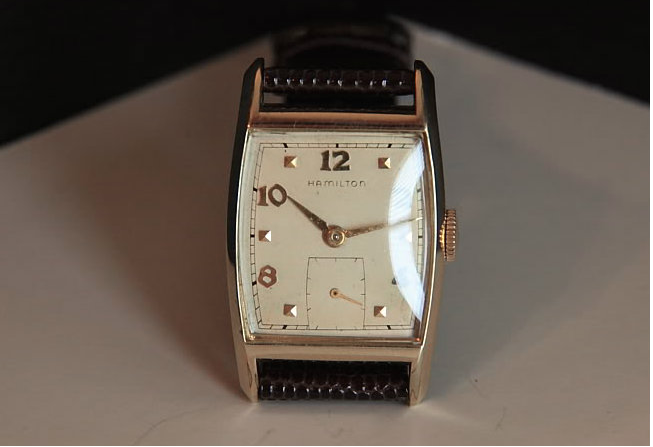 In 1931 Hamilton introduced a variety of new watches to replace the lineup of geometrics from the late 1920's. One of the new models was the Square B. 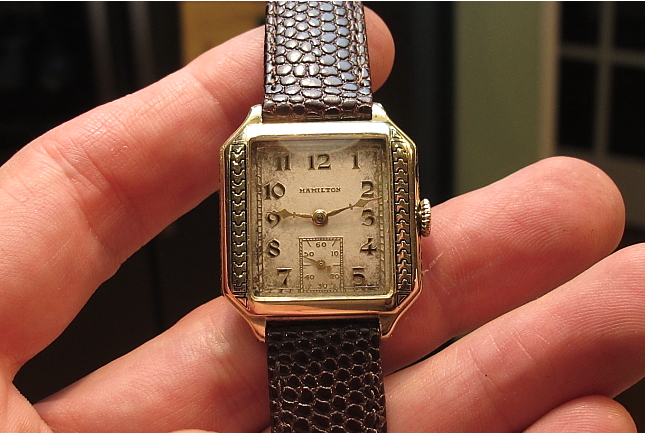 Although similar to the 1927 Square Cut Corner, the Square B had an entirely different bezel shape and the crystal was rectangular. 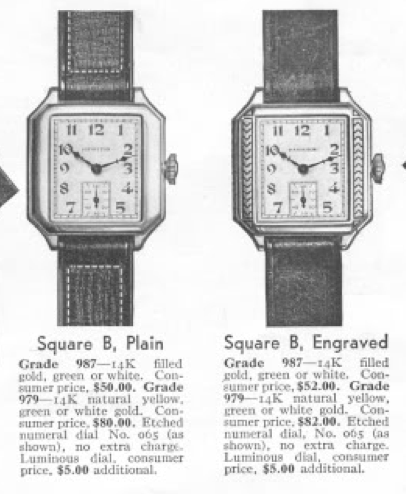 The Square B was only made for two years... 1931 and 1932. The Square B came in two varieties... Plain and Engraved. Personally I find the Plain to be aptly named as it really doesn't do much for me. The Engraved version is much nicer in my opinion. Some folks have mentioned it as Hamilton's first asymmetrical but I guess the Spur would have that honor. The Square B came in yellow, green and white gold as well as gold filled. 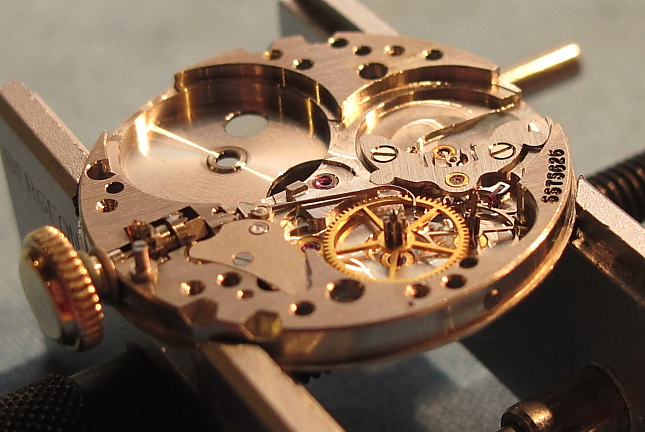 The solid gold watches got the 6/0, 19 jewel 979-F movement while the filled gold variety received the 17 jewel 987 movement. 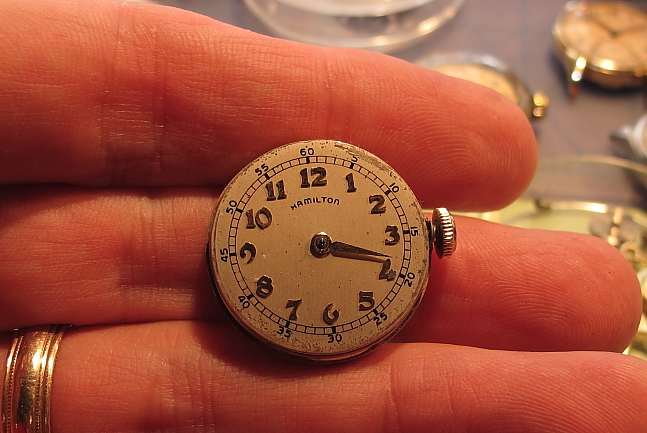 I recently had the opportunity to snag an etched dial variety in a green filled case. It was a little bit of a longshot - I only had one photo to go with. As received it was in pretty good shape. Definitely in need of some cleaning and a new crystal. Here's a shot of it after a little cleanup to the case. 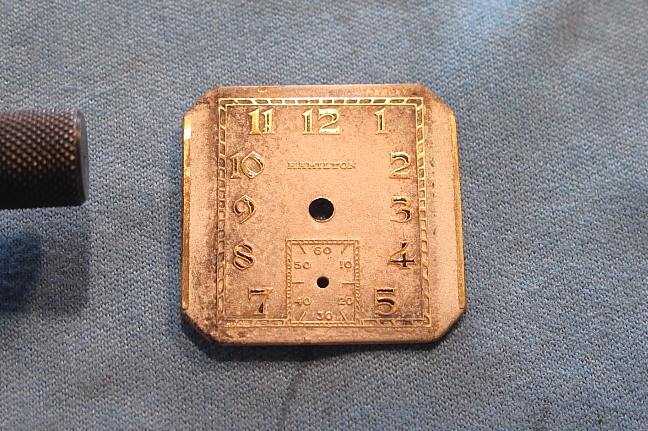 The etched dial is very interesting I think. 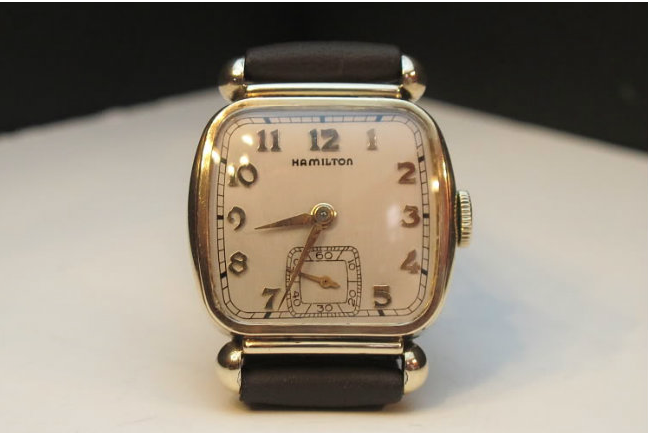 There are some black enamel highlights to the numbers, much of which has been lost to time. If I had a really steady hand I would be tempted to redo some of it. 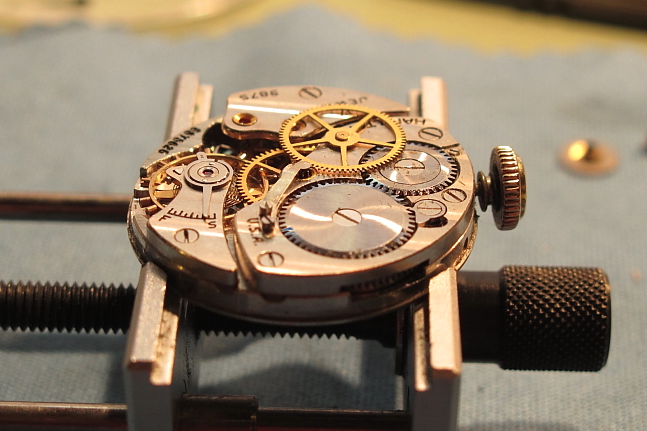 But I decided to let it be and just gave the dial a very gentle cleaning. The 987-F movement was in decent shape, just a little dusty. 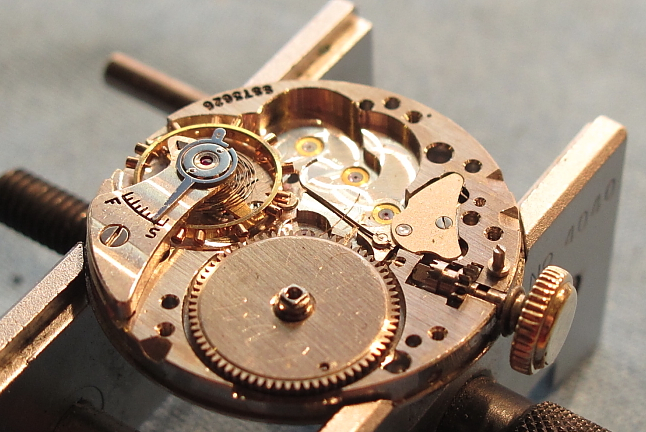 The F is for Friction as the jewels in the F movement are pressed in place and held by friction and not by little screws as in the regular 987 movement. With the mainspring tension released, I can pull the barrel bridge to reveal the mainspring barrel, the center wheel and the third wheel. Next to come off is the train bridge to reveal the fourth wheel and the escape wheel (with the saw-tooth like appendages). Everything just slips right out at this point, leaving the balance assembly and the pallet fork beneath it. With the balance removed all that's left is the pallet fork held in place by it's bridge. While everything cleans I get a new glass crystal ready for final shaping and installation in the bezel. Shaping glass crystals with 600 grit sandpaper can take up to 20 to 30 minutes sometimes but getting it to fit just right is important. 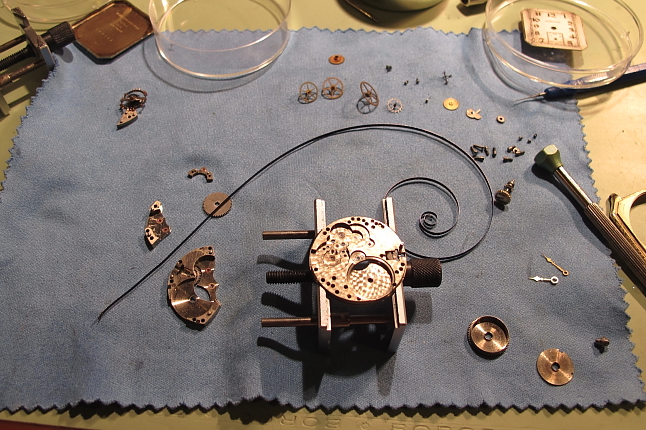 Everything is dried and laid out for assembly, including a new mainspring. 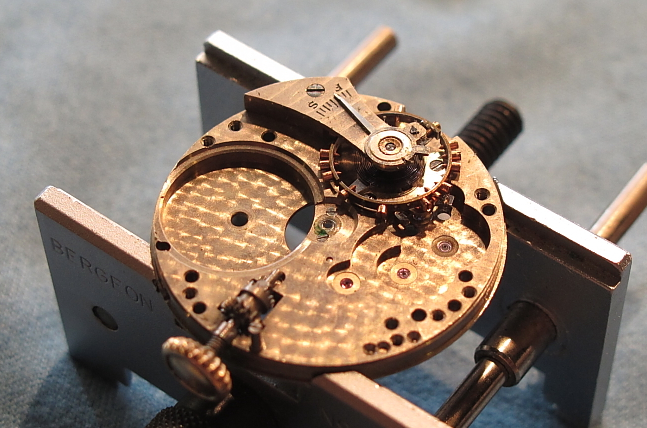 Here the mainspring is tucked safely into it's barrel and the arbor is installed. A fresh coat of lubricating grease will keep it happy for years to come. Well, putting it all back together is pretty much the same as the above, but in reverse order. The only difference is I like to put the balance on last. I re-enameled the engravings on the case and installed a new lizard strap in brown. 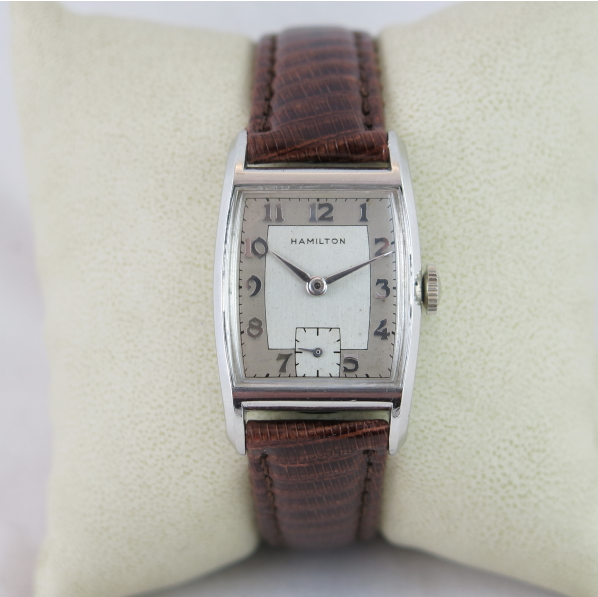 This is a nice looking watch and it is definitely ready for some wrist time. 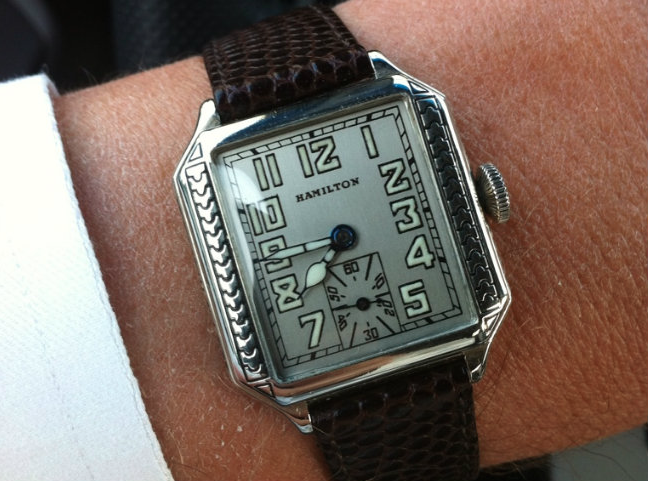 Here's a wrist shot of another Square B Engraved I recently restored... this one with a luminous dial. I sent this to an appreciative buddy in Australia, or Africa, or where ever he may be. I still miss it... sob sob. And just for reference, here's a decent shot of a Square B Plain courtesy of Tom Diss ... note that it's pretty plain. 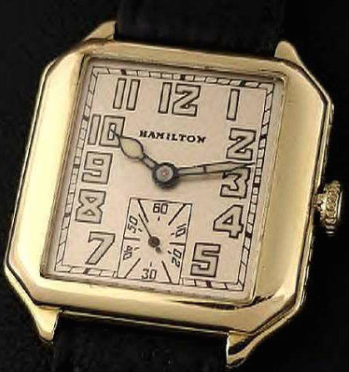 At the conclusion of WWII, Hamilton switched back from dedicated military production to civilian production. 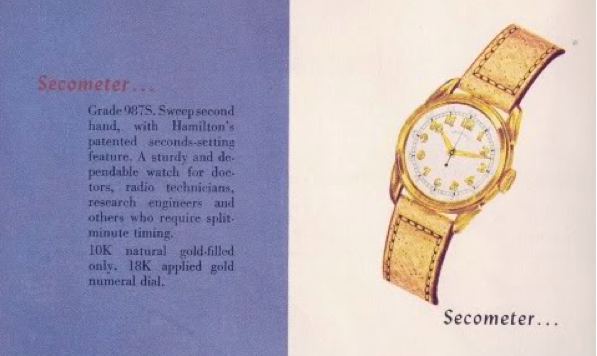 One of the watches introduced in 1946 was the Secometer. 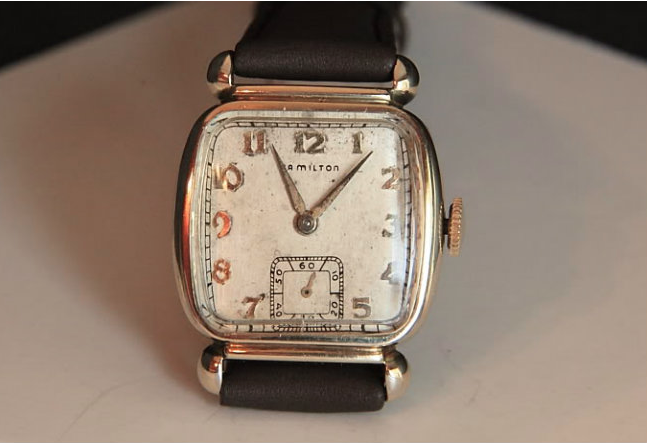 The Secometer was based on the same 6/0 sized, 17 jewel 987S movement that military watches used as well as the 1940 Sentinel. In fact, the Secometer and the Sentinel share the same case. 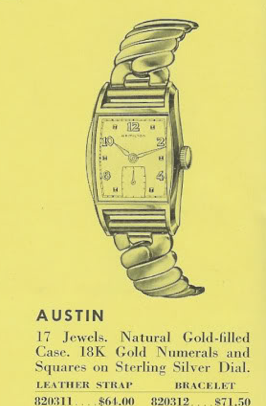 I believe the Sentinel was offered in 1941 with an AGN dial - but without a second hand. However, I've never seen one and I'm not sure I could tell it apart from a Secometer unless the dial pattern is different. 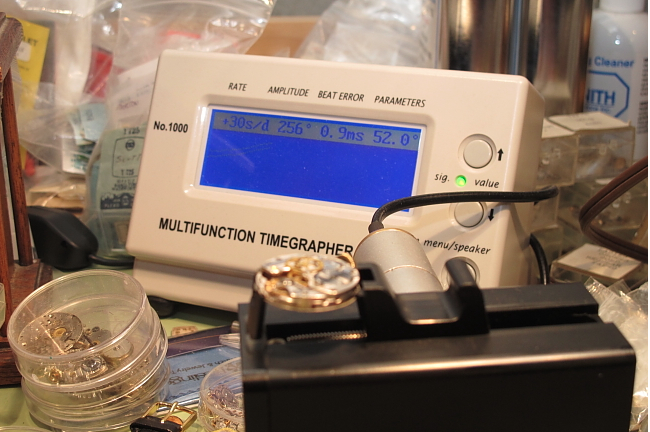 Anyway, the Secometer came in a 10K gold filled case with an AGN dial as shown above. The case is prone to wear through on the tops of the lugs and case back lip. 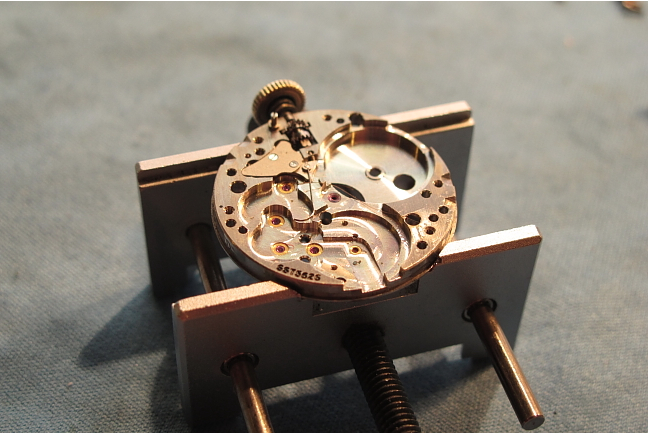 Since the Secometer has the 987S, the movement will hack, or stop, when you pull the crown out to set the time. 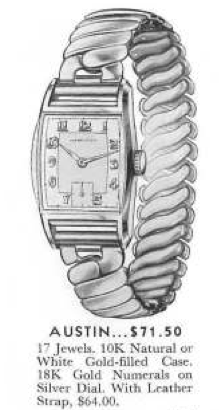 First, as received the watch was missing it's minute hand, second hand and crystal. 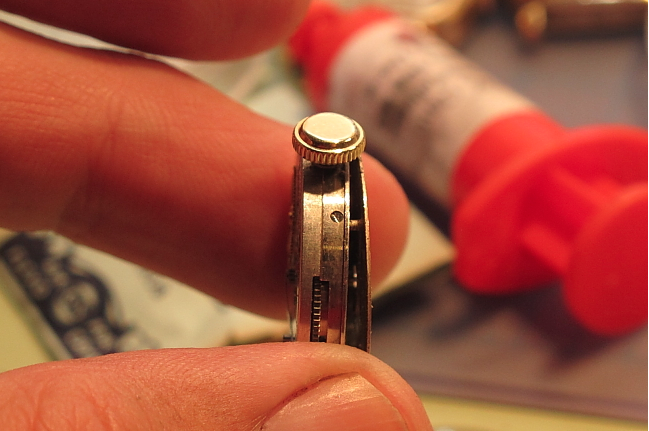 I put a new crystal on to protect the dial while the watch waited it's turn for some TLC. 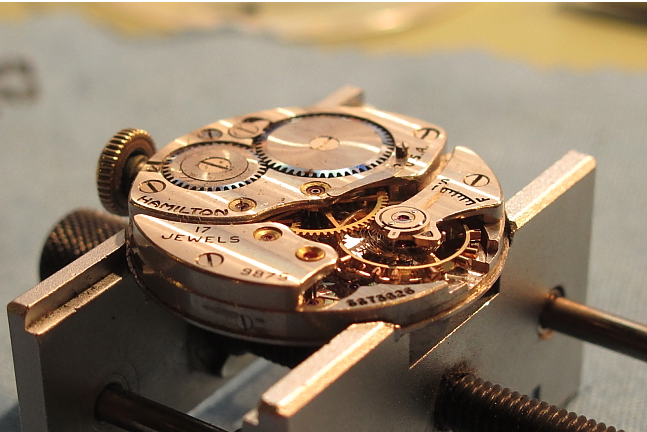 The dial is an old, but well done, refinish. Just needs a little cleaning to look great again. 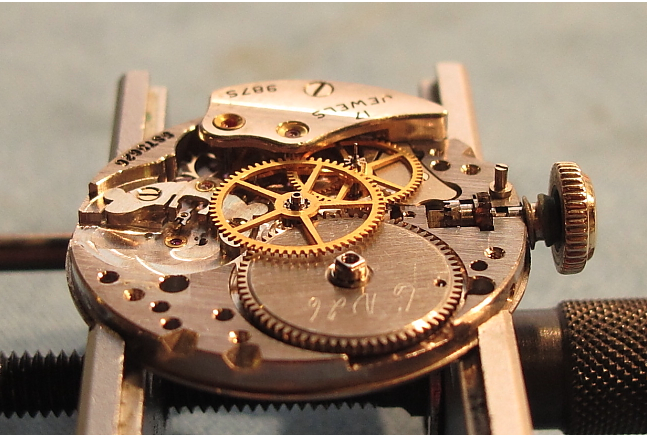 Dials are held on by small screws in the side of the movement that bear against the dial feet attached to the dial itself. A 987S has three dial feet locations. 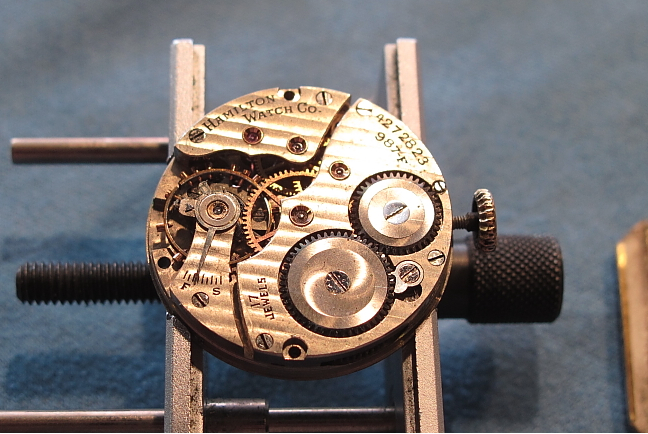 With the dial removed the hour wheel and cannon pinion can be removed. These are the parts the hands attach to. You can also see the seconds hand pivot sticking out of the center of the center wheel shaft. 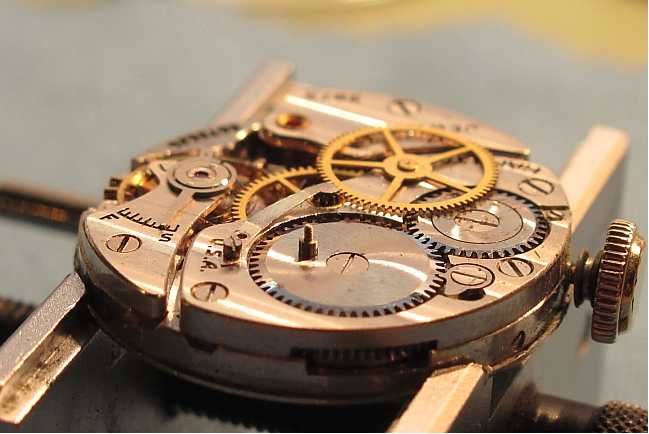 What makes a 987S different than a 987A is the addition of the seconds wheel and pinion on the back of the movement. 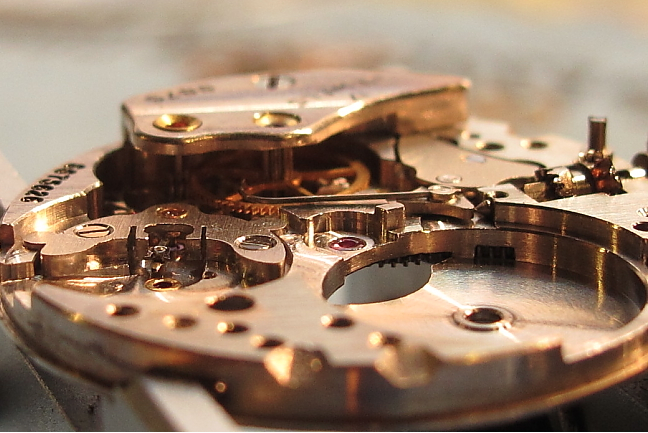 This allows for a sweep second hand instead of a sub-second hand. 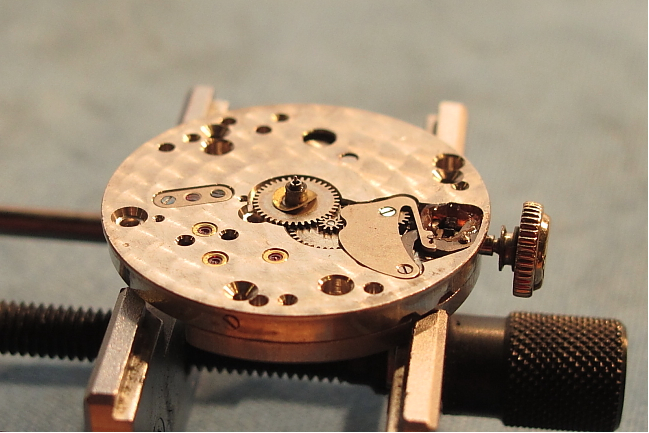 The two screws that hold the spring arm that secures the second hand pinion and shaft are tiny. Getting them lined up to go back in takes a gentle touch or they can spring off into space, never to be seen again. 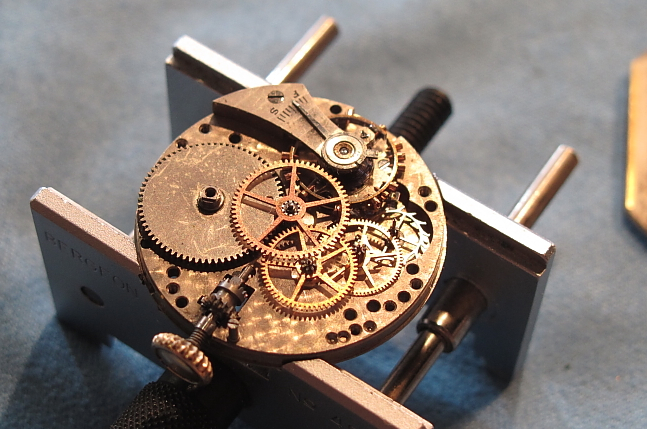 Here the second hand pinion and shaft is standing a little proud of the back. It just slips right out. With the seconds wheel removed you can see the pivot that it attaches to. 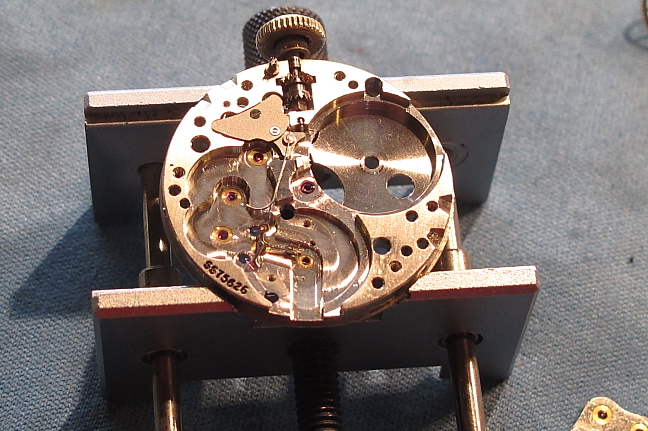 At this point the movement is pretty much the same as a 987A - except that it has the parts to "hack" still inside. 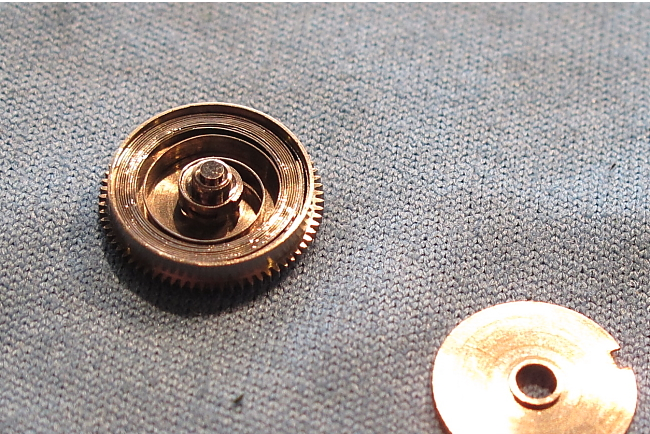 With all the mainspring tension let off, the mainspring winding wheel is removed. 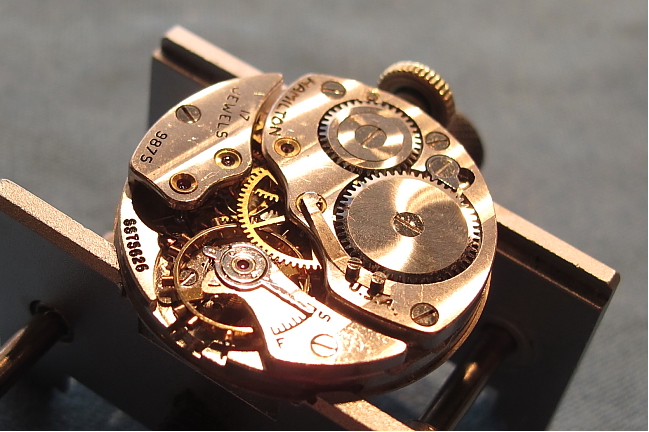 The next bridge is removed to reveal the fourth wheel (the seconds hand on a 987A would attach to the fourth wheel) and the escape wheel. All the wheels can all be removed now. 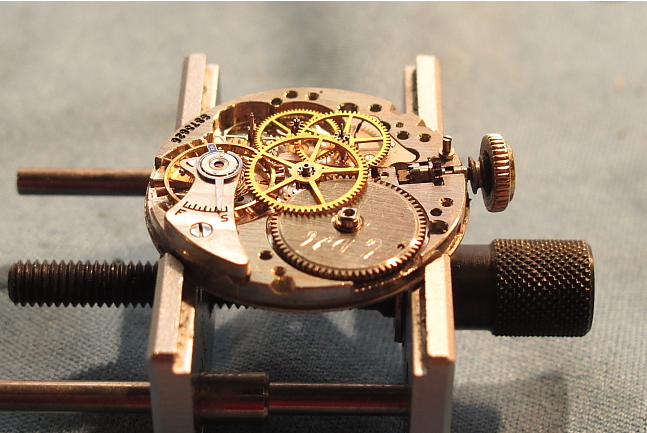 Here's good shot of the linkage that will hack the watch when the crown is pulled out to set the time. 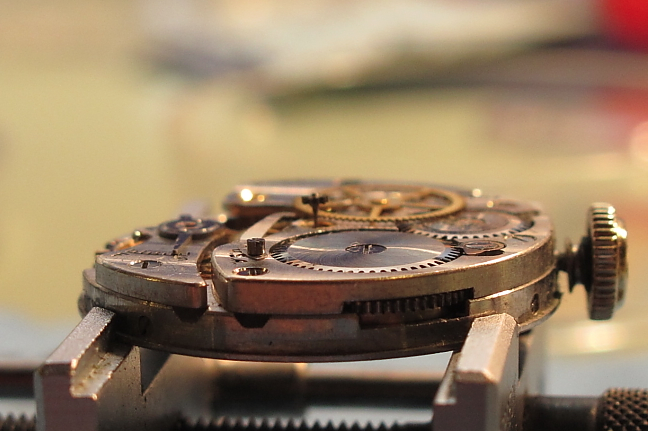 The little bent section near the balance wheel is pulled over and it hits the balance wheel to stop it. Push the crown back in and it moves away from the wheel - as shown below. 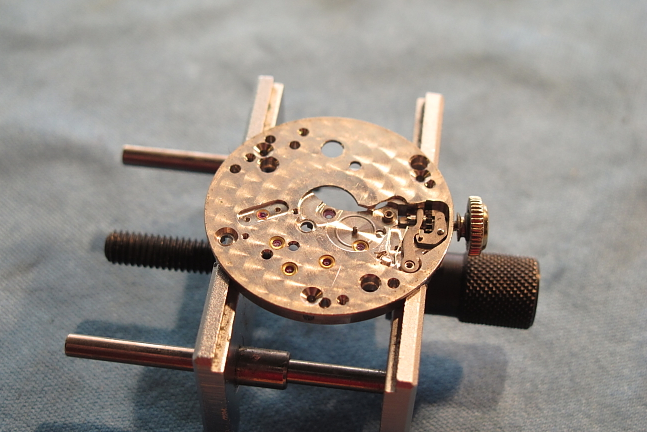 With the balance and the pivot fork assembly removed the back of the watch is cleared off. 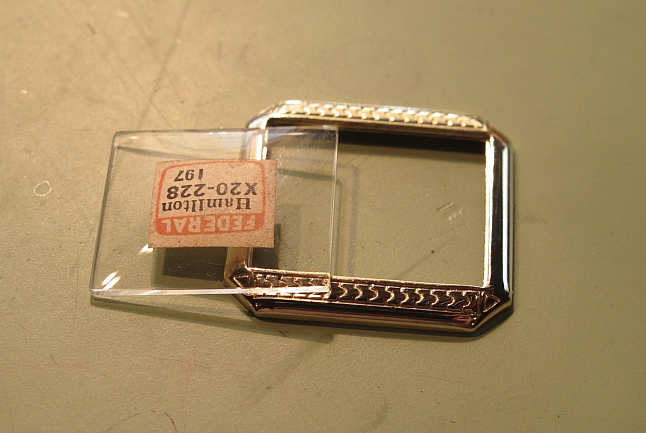 On the front side, the keyless works and cap jewel are removed. Everything is separated for a thorough cleaning. 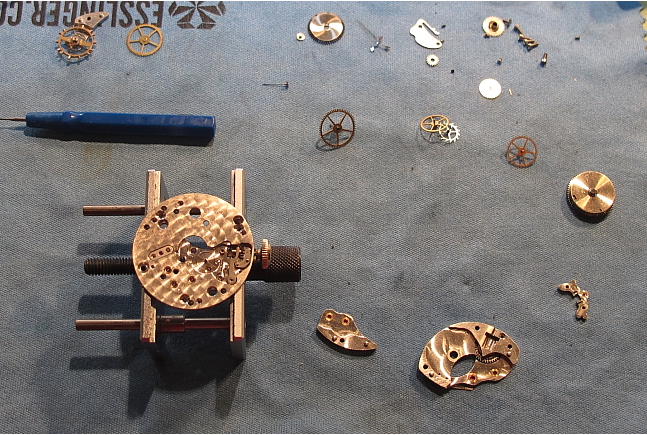 While stuff cleans, a fresh mainspring is installed and lubricated. 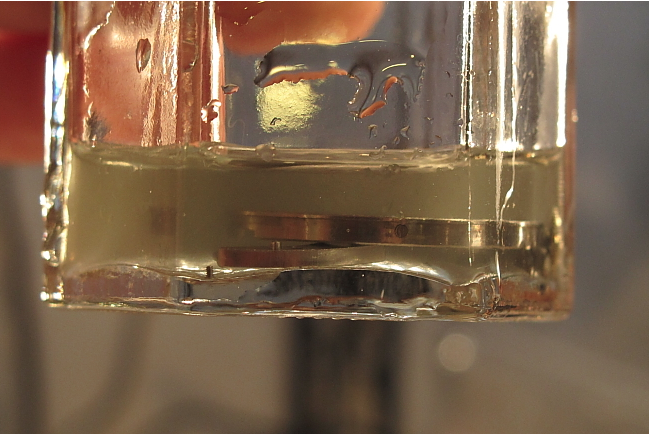 I'm always surprised at how dirty the cleaning solution gets after the parts are ultrasonically cleaned a while. I use several series of cleaning solutions to get the parts throughly cleaned. Everything is laid out to dry and be lubricated during assembly. First the pallet fork goes back in. Every jewel gets a tiny droplet of oil. Here the pallet fork bridge is installed. 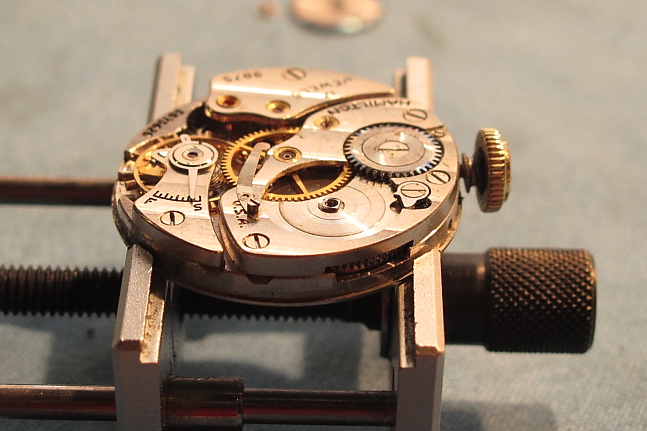 Getting everything properly lined up is the key to putting a watch back together. If it doesn't fit smoothly and perfectly then something isn't lined up right. Force will not fix it - it just breaks the part that's not lined up right. The two pallet jewels also get a droplet of oil. Now the escape wheel and fourth wheel go back in. And their bridge is reinstalled - again, everything has to line up right. Now the third wheel, center wheel and mainspring barrel go back on. And their bridge is reinstalled. 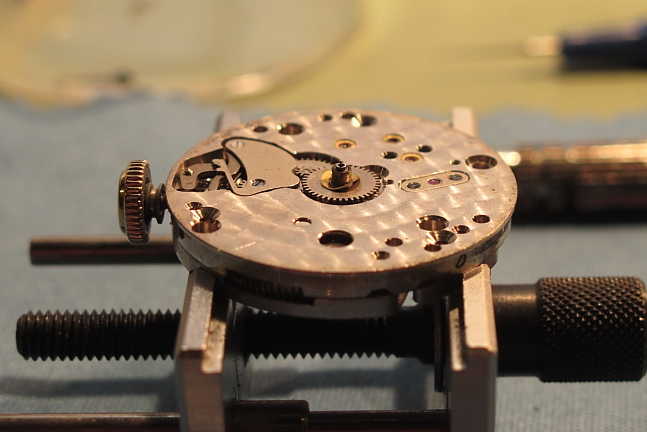 The seconds pinion and shaft goes back in and the mainspring winding wheel is reinstalled. 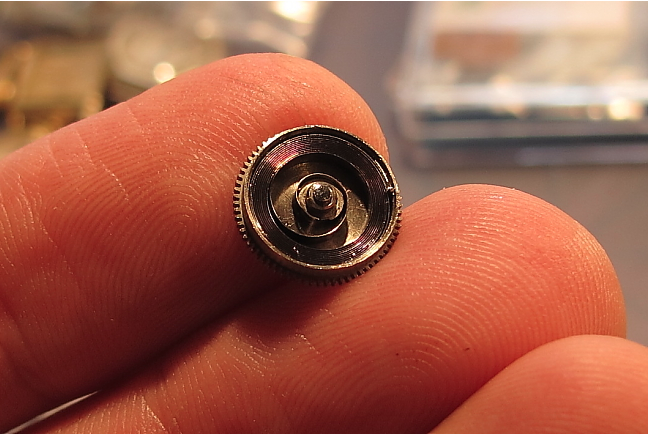 At this point a few turns of the crown will put power back into the gear train. I prefer to put the balance on before the seconds wheel - that way I know the watch runs before I try to put the wheel back on. If I have problems after the wheel is installed I'll know it's the wheel and not elsewhere. 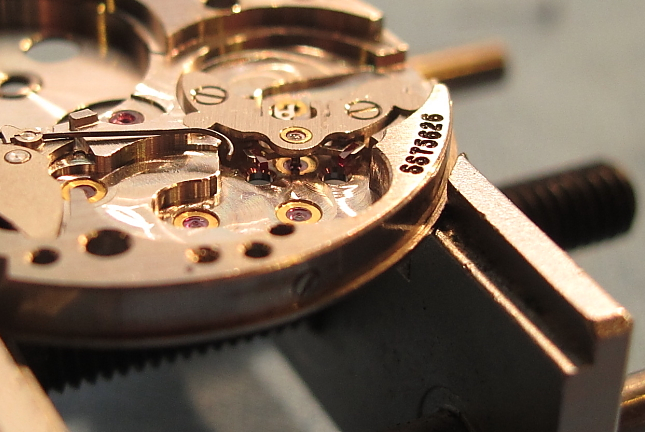 With the seconds wheel reinstalled, the assembly goes onto the watch timer ... 30 seconds fast per day. Not too bad but a slight tweak to the regulator can slow it down. 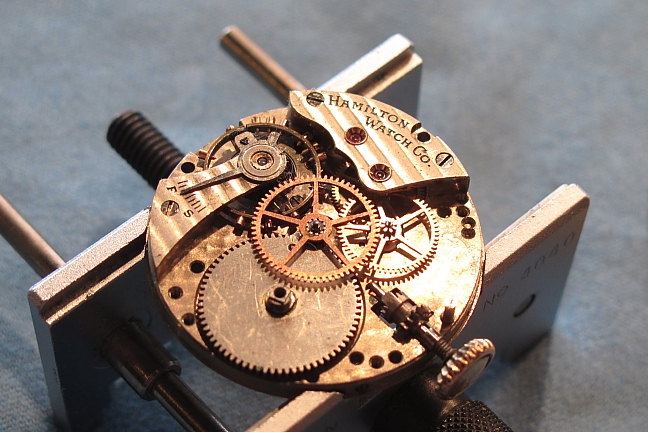 The cannon pinion and hour wheel are reinstalled and the keyless works greased. 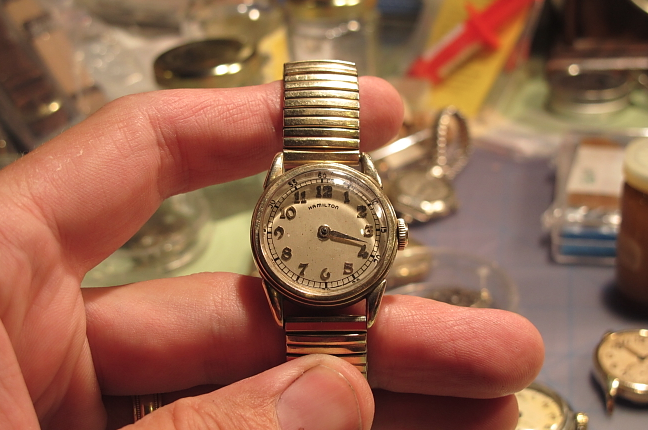 With the dial back on and replacement hands - the watch goes back together inside the freshly polished case. 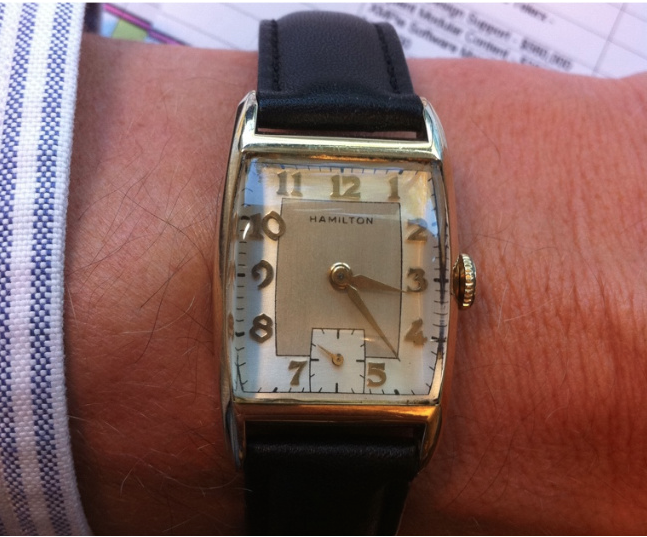 And now the prerequisite wrist shot of the completed project. Ready for another 60 years of service.